Here’s a sample of what you can expect from taking lessons from a reputable flight school. First, and foremost, there is ground school. Depending upon the school you attend, it can be part of each daily flight lesson or done all at once. The concepts given are really simple to understand, and pretty much common sense; however, they are important, so learn well. There are some written tests that you will have to take which are required by the USHGA before any instructor can issue you a Hang certificate. Upon successful completion of these tests you will be awarded your Hang 1 (novice) and Hang 2 (beginner) ratings. All other ratings require additional airtime and successfully being able to perform specific tasks. All this comes with time. Don’t ever expect it to happen overnight. Now back to the ground school. During this part of the learning process you will be taught about the parts of the glider and what makes a glider fly, in other words, basic aerodynamics. You then will move onto discussions of micrometeorology, or the non-meteorologist way of relating what you see in the sky to what type of flight conditions you can expect. Again, really simple stuff, so don’t sweat it, but do know and respect it. Along with this you will discuss wind currents, what causes thermals, and how these effect gliders. 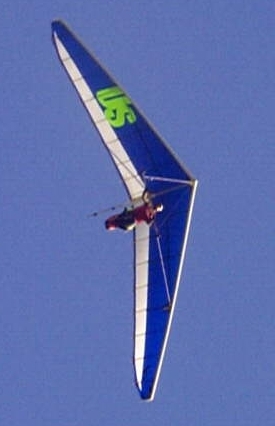 Lastly, although you really never stop learning, you will discuss the rules developed by the USHGA and the FAA that apply to hang gliding, as well as, the necessary safety equipment and checks needed before each flight. Again, these rules and checks are more common sense than anything else, but an absolute necessity for a safe successful flight. Ok, so you’ve done all the bookwork. Now it’s time to fly, but first things first. You need to work in a static simulator to learn the proper body movements so that you will be able to steer the glider. If your school is so equipped, you may even "fly" in a virtual simulator. This is typically a control bar attached to a video representation of hang gliding simulation. After an hour or two you’re ready to hit the training hill with the real thing. Next you will learn how to properly set up a glider and pre-flight it. At first sight a hang glider in its bag may seem like a flimsy mesh of wires, tubes, and fabric. Once assembled you will see it is a really neat and sturdy flying machine. Off to the training hill. On the training hill, or really on flat level ground, you first learn how to hold onto the glider, and then how to run with it and how to push it out, as if you were stopping a flight when landing. Each time you do this you may venture a little further up the gentle slope, giving you the ability to actually get the glider to lift off your shoulders. Once at the top of the training hill, you get to use all that you’ve learned so far in your first actual flight – yes, your feet will leave the ground! During these very short and very low flights of just a few inches to maybe three feet or so off the ground, you get to practice good directional control of the glider. You also get to practice proper launching and landing technique. While these flights are probably the most demanding physically and mentally, they are the utmost important ones in your entire flying career. Developing proper good habits is what it’s all about. You don’t ever want to carry a bad habit to a mountain launch. You will quickly learn that if you do not run correctly, hold the glider properly, make turn corrections properly, or flare at the proper time that you will not have a successful flight, but not to worry, that’s why you’re here and not on the mountain yet. Before you know it you’re ready for a larger training hill, one where you will get more airtime. You’re ready because you proved that you are in control. At first sight the larger training hill may seem overwhelming. In reality, it’s easier to launch from than the flatter hill you just came from. After you take that first step all apprehension disappears and you’re in the air, actually flying. Although the actual flight time is quite short, maybe 30 to 45 seconds or so, it seems like it’s a lot longer. With each flight here, you develop a bond with your glider and a bond with nature. You learn to "listen" to what your glider is telling you and learn to respect what nature can, and will, through at you. 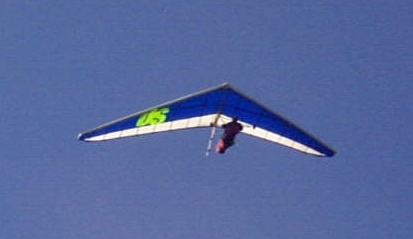 Once comfortable with your glider and nature you begin to perform a series of increasingly difficult tasks. Things like 45-degree turns, fast and slow flight, and spot landings are commonplace items. After performing well here, and both you and your instructor know you are ready, you will have your first mountain flight. The first mountain flight is a lot like your first larger training hill flight, but now you know a lot more than you ever did before, and are ready for it. Just like the larger hill was to the shallow training hill, the mountain is to the larger hill. It’s a lot easier! The best part is the amount of actual airtime you will get to "play" around before you have to land. Since you have already learned good habits, here you get to use those skills further toward developing "smart flying" habits and good approaches to the landing zone. It does not take long to do this, maybe 5 to 10 flights or so, then you will start learning to soar, find thermals, and handle more of what nature can through at you. You’re now a true pilot, free as a bird. Your level of skill only inhibits your flight experiences from now on. At this point you may think your flight lesson are over. Not true. Each time you fly you will learn something new. Take what you learn and use it to fly smart, and most of all, have fun.